Preludio y Fuga, by Alberto Morelli, guitar. First Unitarian Universalist Church of Houston, November 16, 2013. Lullaby for an Ancient Grandfather, En la mar hay una torre, Milonga del atardecer, for clarinet and piano. Venancio Rius, clarinet. Sponsored by Centro Canadiense Comahue. Museo Nacional de Bellas Artes, Neuquén, Argentina, August 2, 2013. Preludio y Fuga, by Alberto Morelli, guitar; Momentum, by Venancio Rius, clarinet; Estudio de tango No. 1, by Alejandra de los Santos, flute; Las manchas del sapo (How the Toad Got His Spots), Alejandra de los Santos, flute; Susana Bustos (bassoon), Martin Kutnowski, narrator. All at the recital "De sur a norte, música y encuentro," sponsored by Municipalidad de Comodoro Rivadavia, Fundación Nuevo Comodoro, and Centro Canadiense Comahue, Argentina, July 27, 2013. Lullaby for an Ancient Grandfather, for orchestra. Andrés Tolcachir, conductor. Orquesta Sinfónica de Neuquén. Neuquén, Argentina, July 26, 2013. En la mar hay una torre. Venancio Rius, clarinet; Alfredo Corral, piano. Museo de Arte Hispanoamericano, Buenos Aires, Argentina, July 17, 2013. Momentum. Venancio Rius, clarinet. La Vidriera de la DGEAR, Buenos Aires, Argentina, July 15, 2013. Momentum, for solo clarinet. Venancio Rius, Auditorio Andrés Gaos, Conservatorio Superior de Música de A Coruña, Spain, June 26, 2013. 12 Etudes dans le style du tango, for solo flute. Conservatoire de St. Maur (Conservatoire national de région CRR/CRR), France, June 17, 2013. Watercolors, Elena Rojas, Director. Carlucci American International School of Lisbon, June 14, 2013. The Spots of the Toad. Ensemble Epomeo. Scotia Festival of Music, Halifax, Canada, June 7, 2013. The Spots of the Toad. Premiere in Portugal. Elena Rojas Crocker, violin; Karolina Andrés, cello; Helen Jenkins, narrator. Carlucci American International School of Lisbon, May 9, 2013. Buenos Aires Y2K. Premiere in Brazil. Primus Trio, Cláudia Nascimento, Emília Valova, Tamara Ujakova, Escola de Música da Universidade Federativa de Rio de Janeiro, Brazil; live podcast: Rádio MEC FM, 98.7Mhz, May 3, 2013. En la mar hay una torre, for clarinet quintet. Premiere in Spain. Moncofa, Edificio Polifuncional, December 15, 7PM; La Vall D'Uixó, Auditorio Conservatorio de Música, December 17, 7:30PM; Valencia, Palau de la Música, Sala Rodrigo, December 18, 7:30PM. Project supported by a travel grant from the Canada Council for the Arts. Venancio Rius Martí , clarinet; Rousseau String Quartet: Enrique Palomares and Albert Skuratov, violins; Santiago Cantó, viola; David Barona, violoncello. "Five Argentinean Folk Dances" (Premiere in Israel), Hemda Raz and Alberto Portugheis, piano four hands. Celebrating Argentina Festival, "Remembering Astor Piazzolla on the 20th anniversary of his death." Felicia Blumenthal Center, Tel Aviv, Israel, September 25, 2012. “Does the barley bid the wind wait in his course?” for mezzo-soprano and piano, based on texts by Canada's poet laureate Bliss Carman (1861–1929). Project supported by a Creation Grant from Arts New Brunswick; premiere by Patricia Green, mezzo-soprano, and Stephen Runge, piano at St. Thomas University, October 10, 2012; Mt. Allison University, Canada, October 12, 2012. "En la mar hay una torre," Elizabeth Cueli (clarinet), Alfredo Corral (conductor), Orquesta de Cámara Amadeus; Facultad de Derecho de la Universidad de Buenos Aires – Av. Figueroa Alcorta 2263 - Salón Auditorio, Buenos Aires, August 25, 2012. "Buenos Aires Y2K," for flute, violoncello, and piano. Ensemble Pyxis (Agnès Bonjean, piano; Nicolas Vallette, flûtes; Lionel Allemand, violoncelle). Théâtre de l'Ile Saint Louis, Paris, May 15 & June 12, 2012. "Al ver mis horas de fiebre" ("Tandis que mes heures de fièvre"), for flute and piano. Frédéric Chatoux (flute), Bertrand Giraud (piano). December 14, 2011. Opéra (Salle 3 - niveau 2), Ville de Saint-Claude, Haut-Jura, France. "Al ver mis horas de fiebre" (Seeing My Feverish Hours), for flute and piano, based on three "Rimas" by Gustavo Adolfo Bécquer. Commissioned, dedicated to, and premiered by Karin Aurell (flute) and Janet Hammock (piano). Supported by a Commissioning Grant from the Canada Council of the Arts (September 2010). In the same program, performance of "Buenos Aires Y2K," for flute, cello and piano, performed by the Two Oceans Trio: Karin Aurell, flute, Janet Hammock, piano, and Joel Stobbe, cello. September 29, 2011: Mount Allison University, Marjorie Young Bell Conservatory of Music, Brunton Auditorium (World Premiere); September 30: Université de Moncton, Salle Neil Michaud, Music Department; October 1: Mahone Bay, NS, Celia's Retreats Concert Series, Mahone Bay; October 1: Antigonish, NS, St. Francis Xavier University, Performing Arts Series, Immaculata Auditorium; October 4: Fredericton, NB, St. Thomas University, Fine Arts Programme; October 5 – Wednesday: Music On The Hill Concert Series, Memorial Hall, University of New Brunswick; October 6: Picadilly, NB. "En la mar hay una torre” version for clarinet and solo piano, Wesley Ferreira, clarinet; Gail Novak, piano. Clarinetfest, Los Angeles, August 5, 2011. "Peter Emberley's Dream” for solo piano, (World Premiere); Three Rivers Conservatory, Mass. April 1, 2011. "12 études dans le style du tango” for solo flute, Karin Aurell, flute; St. Thomas University, February 14, 2011; New Music in New Places (Canadian Music Centre):VIA Rail stations in New Brunswick and Nova Scotia (Moncton, Halifax, Miramichi), February 28 through March 11, 2011. "En la mar hay una torre" (“There's a Tower at the Sea”) version for clarinet and string quartet. Ensemble Epomeo (Caroline Chin, violin; David Yang,viola; Kenneth Woods, cello) and guests, Wesley Ferreira, clarinet; and Nadia Francavilla, violin. St. Thomas University, November 9, 2010. "The Spots of the Toad" (Canadian Premiere) Auricolae: David Yang, narrator; Caroline Chin, violin, Kenneth Woods, cello; McCain Recital Hall, St Thomas University, Fredericton, November 8, 2010. "Good Breathing" + "12 Etudes dans le style du tango." 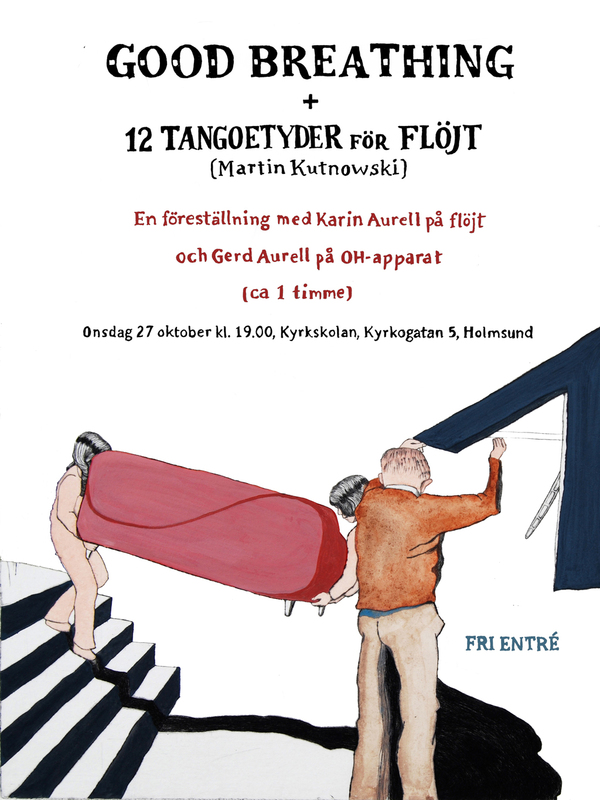 A performance withKarin Aurell on flute and Gerd Aurell on overhead projector. Wednesday Oct 27, 19.00. Kyrkskolan, Kyrkogatan 5, Holmsund, Sweden. Kaleidoscope, for solo piano" (World Premiere) Bertrand Giraud, piano. Generously supported by a Creation Grant from Arts New Brunswick (artsnb). Ecole de Musique de Coulombes, Paris, October 13, 2010. "Between the Salt Water and the Sea Sand," based on maritime folksongs. Commissioned by St. Thomas University for its Centenary (1910-2010). World Premiere by soprano Wendy Nielsen, to whom it is dedicated, accompanied by Robert Kortgaard at the piano. The program also includes music by Mozart, three songs by Resphighi, five by Ferrans Obradors, and Louis Andriessen's 'satirical arrangements' of four Beatles tunes. September 25, 8 p.m. McCain Hall, St. Thomas University, Fredericton. $25. Tickets at Westminster Books and STU. "En la mar hay una torre" (“There's a Tower at the Sea”) for flute and string orchestra. Saul Martín, flute; Diego Lurbe, conductor; Orquesta Municipal de la Ciudad de Olavarria, Olavarria, Argentina, August 22, 2010. "Las manchas del sapo" (The Spots of the Toad"). Argentinean Premiere, in Spanish. Alfredo Corral, conductor. Conservatorio Nacional, Buenos Aires , August 8, 2010. "Buenos Aires Y2K" (Canadian premiere). Joel Stobbe, cello, Laurie Syer, violin, and Janet Hammock, piano. Bergen Church, Strings and Keys, Alberta, Canada, Tuesday, July 6, 7:00pm, 2010. "Five Argentinean Folk Dances" (European Premiere) Julian Jacobson & Alberto Portugheis, piano four hands. Alberto Portugheis, Martha Argerich & Friends, Kings Place, London, Sunday 4 July, 2010. "Clarinet Concerto" (World Premiere), dedicated to clarinetist Venancio Rius Marti, Schubert London Players; Alfredo Corral, conductor. Presented in the same concert with “En la mar hay una torre” (European Premiere) and Richard Gibson's “Neo Baroque Suite” (European Premiere). Simon Bolivar Hall, London, UK. March 5, 2010. Event supported by Arts New Brunswick. "Five Tango Etudes"(Canadian Premiere). Janet Hammock, solo piano. Presented as part of the cycle "Portraits of Sound," commemorating the 50 year anniversary of the Canadian Music Centre. The event also featured oil paintings, watercolors, and ink drawings by artist Adriana Reta. Owens Art Gallery, Mount Allison University, November 14, 2009. Repeat performances on November 17 at the Music Recital Hall, St Thomas University, Fredericton, and on 21 November, at Brunton Auditorium, Mount Allison Department of Music, New Brunwick. "Sunset Milonga" and "Puppet Tango," from "Watercolors for Ten Fingers" FJH), arranged for the Guitar Duo Bocaccio-Gallino. Presentatión of the CD "Al Toque." Asociación Cultural Pestalozzi, Buenos Aires, November 7, 2009. "En la mar hay una torre" (“There's a Tower at the Sea”)for flute and string orchestra. Premiere in Argentina. Saul Martín, flute; Alfredo Corral, conductor; Orquesta Juvenil de Radio Cultura. Palacio de la Legislatura de Buenos Aires, September 25, 2009. "En la mar hay una torre" (“There's a Tower at the Sea”) for clarinet quintet. Commissioned, and dedicated to, Water Play 2009, Eighth Annual Newburyport Chamber Music Festival; David Yang, Artistic Director. Clarinet Quintet: Todd Palmer, clarinet; String Quartet-in-Residence: David Yang, David Ehrlich, Nurit Pacht, Caroline Stinson. St. Paul's Church, Newburyport, Massachussets, August 16, 2009. "The Spots of the Toad," for narrator, violin, and violoncello. Commissioned, and dedicated to, Water Play 2009, Eighth Annual Newburyport Chamber Music Festival. Open rehearsal 10:00A.M.-12:00P.M (free), Newburyport Public Library, 94 State Street, Newburyport; Children's Concert, 2 P.M., Haverhill Public Library; Children's Concert, 4 P.M., Newburyport Public Library, 94 State Street. Newburyport, Massachussets, August 12, 2009. "Tango Rhapsody," for piano and orchestra. Project commissioned by Ana Lourdes Rodriguez and funded by Arts New Brunswick. Ana Lourdes Rodríguez, piano; Cuauhtémoc Juárez, Conductor. Orquesta Filarmónica del Estado de Querétaro. Teatro de la República, Querétaro, Mexico. March 20, 2009. "Five Argentinean Folk Pieces ," for chamber orchestra. Minnesota Sinfonia; Jay Fishman, Conductor. Metropolitan State University, St. Paul; Basilica of St. Mary, Minneapolis, March 13 & 14, 2009. "Watercolors for Ten Fingers," "Echoes, Pictures, Riddles and Tales," and pieces from "Contemporary Collage, Vols. 1, 2, and 3," in a piano recital organized by the Fredericton Music Teachers Association. Katrina Amos, Kiersty Amos, Bronwyn Briden, Meredith Briden, Alanna Bohnsack, Julie Choi, Lavallee Forbes, Anna Kierstead, Jacob Demerson, Jake Dow, Sarah Hand, Jorian Hapeman, Emily Harding, Mallory Kelly, Iris Kim, Jennifer Le, Tate Lejeune, Hyun Min Lee, Brennan Minchin, Claire Ma, Alyse Reimer, James Tang, Jonathan Tang, and Tristan Workman, presented by Jane Bowden, Joy Broad, Tanya Clark, Wendy Beardall, Catherine Hughes-Seto, Jennifer Mok, and Roseanna Rudolph. Saint Thomas University, Fredericton, Canada. November 3, 2008. "Buenos Aires Y2K," by Frédéric Chatoux, flute, Delphine Biron, violoncello, and Bertrand Giraud, piano. Concert ''Fantaisies et Découvertes,''IIIème Convention Française de la Flûte. Paris, France. October 30, 2008. "Tango Etude No. 5." Saul Martin, solo flute. Conciertos en el bosque 2008. Rincón de los Andes, Neuquén, Argentina, October 3 & 4, 2008. "Prelude and Fugue," for solo guitar. Project funded through a General Research Grant at Saint Thomas University, dedicated to Tali Roth. Fredericton, Canada, February 28, 2008. "Bordoneo," "Tango," "Milonga," and "Payada," from "Five Tango Etudes." Bertrand Giraud, piano. Eglise Saint-Merri, Paris, France, January 27, 4 PM. "Intermezzo," for Flute Choir, dedicated to the Syrinx Flute Ensemble, conducted by Hiroshi Mochida. Izumi Hall, Osaka, Japan, December 19, 2007. "Buenos Aires Y2K" for Piano Trio, "Five Tango Etudes," Five Argentinean Folk Dances," "Pieces for Children," for piano solo. Recital sponsored by the Iberian and Latin American Music Society, ILAMS. Steinway Hall, London. December 12, 2007. "Twelve Etudes in the Key of Tango," for solo flute. Supported by a Research Grant from Saint Thomas University. Premiered by Saul Martin at the Music Recital Room, STU, Fredericton, on February 28, 2007. Further performances at l'Universite de Moncton, LeFrak Recital Hall, New York, and Grant Recital Hall, Brown University (Providence, RI). Published by Gèrard Billaudot Editeur. "Sacris Solemniis," for Female Chorus (SSA) and chamber ensemble. Commissioned by Saint Thomas University for the Installation of its eleventh president, Dr. Michael Higgins. Premiered at McCain Recital Hall, Saint Thomas University, Fredericton, on January 28, 2007. Further performances on May 26, 7:30 pm at St. Dunstan's Church in Fredericton and in Woodstock, NB, on Sunday May 27, at Woodstock United Baptist Church. The Bel Canto Singers, Karen Arnold, oboe, Douglas Vipond, clarinet, Ivonne Kershaw, bassoon, Martin Kutnowski, piano. Conductor: Willis Noble. For Mezzo-Soprano and Orchestra, with text by Sandro Gindro. Incontri di Musica Sacra Contemporanea 2005, sponsored by Associazione Psicoanalisi Contro. Enrico Marocchini, conductor; Constance Beavon, mezzosoprano; Orchestra Sinfonica Abruzzese. May 23, 2005, Teatro S. Agostino, L'Aquila; May 24, Basilica di San Marco, Piazza Venezia, Rome, Italy. "Lullaby for an Ancient Grandfather"
Deborah Ungar, piano. Atrium Music, Washington State University. Music Teachers National Association. October 29, 2004. Danny Driver, piano. Kretschmer Recital Hall-Art and Music Center, Aquinas College, Grand Rapids, Michigan. February 24, 2004. Danny Driver, piano. The Cabrillo College Distinguished Artists Concert & Lecture Series, Cabrillo College Theater, Santa Cruz, California. Tickets available at the Cabrillo College Ticket Office (831-479-6133) and at Streetlight Records in Santa Cruz. February 20, 2004. "Lullaby for an Ancient Grandfather." Bertrand Giraud, piano. Maison du Peuple, St-Gilles, Belgium. February 8, 2003. "Five Tango Etudes" (premiere in Argentina). Marcela Fiorillo, piano. Museo Nacional de Bellas Artes, Buenos Aires, Argentina. October 19, 2003. "Doma de Potros en La Pampa." Ana Lourdes Rodriguez, piano. Museum of the American Piano, New York. October 2, 2003. "Tango 2K," for piano trio. Solisti Trio, Innsbrook Institute Music School and Festival, Saint Louis. August 31, 2003. "Three Tango Steps." Elena Rojas, violin. LeFrak Recital Hall, Queens College, New York. March 14, 2003. Carnegie Hall, Isaac Stern Auditorium, New York. Karen Rostron, violin, Alexandra MacKenzie, cello, Darrell Rosenbluth, piano. International Piano-Festival "14 Heidelberger Klavierwoche"
Organized by the Association "Jahrhundertwende-Gesellschaft", Festival-Director Martin Münch. German-American Institute of Heidelberg, Sophienstrasse 12. January 11, 2002. For mezzosoprano, mixed chorus, and orchestra. Dedicated to Guillermo Castillón, in memorian. Nathalia Strelchenko - piano, Roger Arve Vigulf - clarinet. Svelvik Hall, Notodden Gallery of Art, Metodist Church at Hoenefoss. Tour Supported by the Communities in Svelvik, Notodden and Ringerike, Norway. September and October 2001. Marcela Fiorillo, piano. Fêtes Musicales de Savoie. Salle Rencontres et Musique Valmorel. Savoie, France. August 2001. Read Review of the CD release (in Spanish). Venancio Rius-Marti, Clarinet (the program will also include the world premiere of Adolfo Villalonga's Variaciones Emocionales para clarinete solo). Conservatorio de Musica y Danza de Ibiza y Formentera. Balearic Islands, Spain. June 25, 2001. Danny Driver, piano. Wigmore Hall, London (European Premiere).